Built for the full gamut of riding styles, the TCX Explorer EVO Gore-Tex Boots and the TCX Airtech EVO Gore-Tex Boots are two sides of the same awesome coin. Whether you are commuting to work in a downpour or taking a long-haul trip through the desert, these boots give you the comfort and confidence to ride on, rain or shine, looking as stylish under a pair of motorcycle jeans as they do under a technical riding pant. The TCX Explorer EVO Gore-Tex Boots strike the perfect balance between form and function with their CE certification, waterproof Gore-Tex membrane and sleek, understated good looks. They are constructed of Cordura abrasion resistant material, backed by Gore-Tex’s 100% guaranteed waterproof, breathable material to keep your feet happy and dry. Trench foot is a thing of the past with these boots. Soft foam padding at the ankle, malleolus reinforcement, reinforced shin plate, and toe and heel counters give you a terrific level of protection for such a versatile boot. The TCX Airtech EVO Gore-Tex Boots are the Explorer’s cool, California cousin, with large areas of breathable, woven Cordura that work to wick moisture away from your feet. The malleolus reinforcement, micro injected shift pad and shin plate, along with the reinforced heel counter, mean that you are not compromising safety for comfort. If you get caught in a passing shower while snaking up Route 1 / Shoreline Highway, these will get you to Bolinas in time for sunset cocktails without needing to stop and wring out soggy socks when you get there. Both pairs of boots have wider metatarsal and lower toe areas, elastic zippers and wide VELCRO® brand fastener bands, replaceable footbeds, with touring soles that have built-in grip areas. 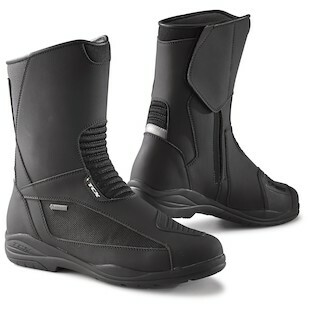 TCX’s reputation for excellence at a reasonable price is only heightened with this Gore-Tex boot, which is no doubt comfortable enough to make it a go-to commuting and touring favorite. 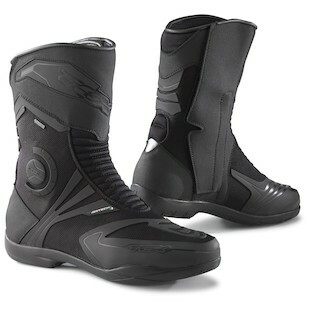 It’s updated fit make it suitable for the riders with narrower feet, giving more riders access to this great line of boots.